Not too long ago, someone left a comment under one of my posts asking me about any difficulties or adjustments that I have had to make now that I am balancing school and being a parent completely on my own. To be perfectly honest, there hasn’t been much of a difference between having someone here to help versus doing it solo. I previously had not lived with my significant other, so for me, it was more of an adjustment having to deal with having another person around. 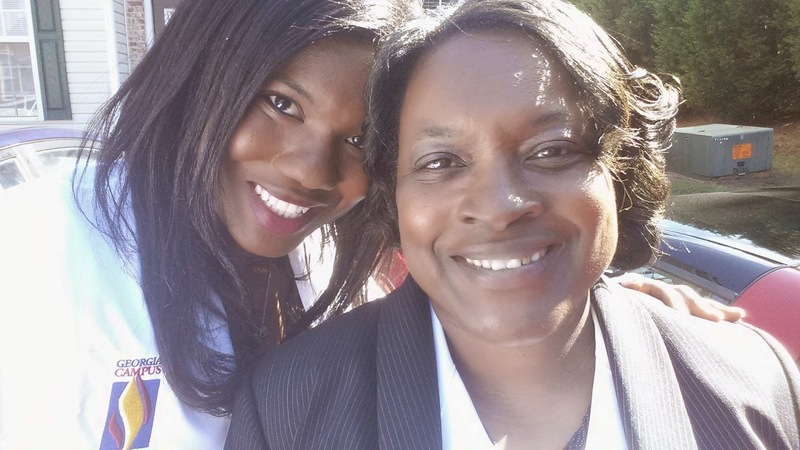 I have also raised my daughter on my own since she was around 1, and I find that as she gets older and becomes more self-sufficient, things tend to get a lot easier. In terms of adjustments, my daughter now takes a bus to after-care every day when she gets out of school, and they are open on school holidays and half-days, so it has not affected my ability to attend classes. I had not taken child care costs into account when I first started school, so that has been a bit of a struggle, but so far we are making out pretty well. My daughter seems to be pretty happy with after-care, and we still have a normal nightly schedule that we follow at home, so that is the only adjustment I have had to make so far. As for difficulties, I can no longer go to campus or the lab whenever I want, but I tend to study better at home anyway. Due to liability issues, children aren’t allowed on campus, so it does interfere with my ability to attend study groups, but technology is a huge help with this. Online chat groups, Skype, and Facebook have made it easier to study with my classmates and make sure that I am not missing important points. When I have to study at home on the weekends, my daughter has been pretty good about leaving me alone, and I still make sure to completely devote one day a week towards spending time with her. 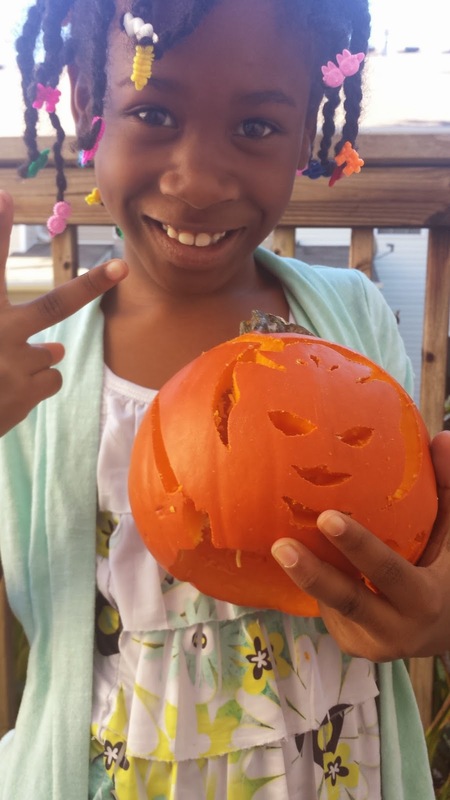 Today we went shopping and carved pumpkins :-) I’m also limited in the amount of social or volunteering events that I can attend, but that just means that I have more time to study. So to make a long story short, being a parent in medical school is definitely a different experience than most other students will face, but it is definitely doable. It’s a balancing act that takes time to perfect (I’m still working on it myself), and there will be times when the dreaded “mommy-guilt” pops ups, but I know what I am doing will benefit both of us in the long run so I keep on pushing. 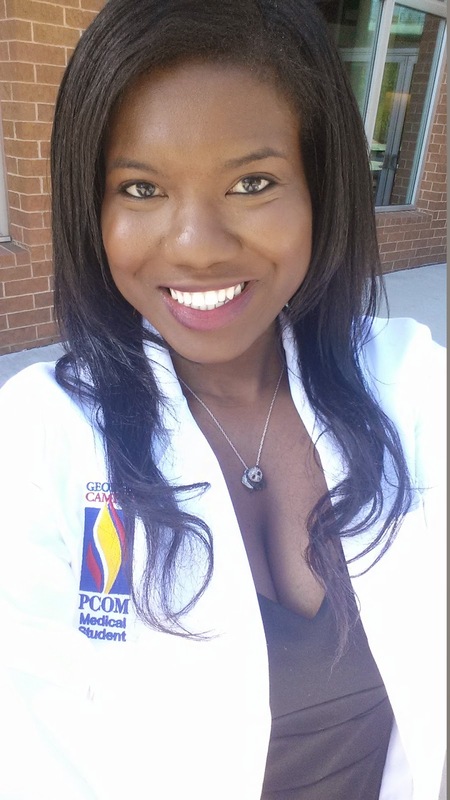 First selfie in my new white coat! 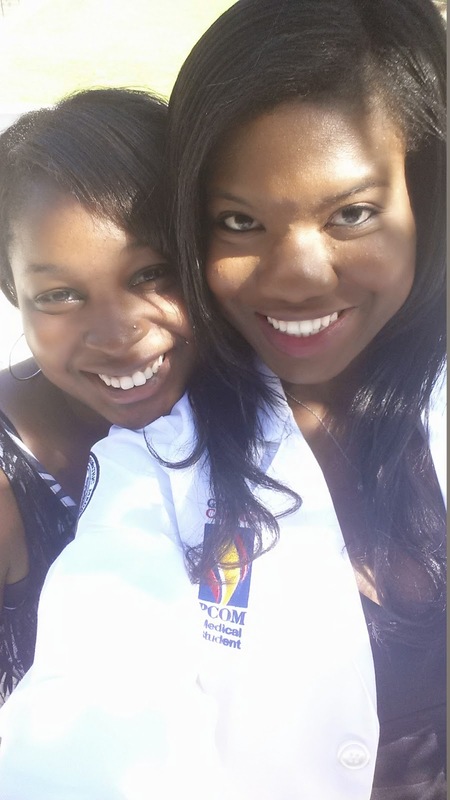 It feels so good to finally have my white coat! On Saturday, October 18th, GA-PCOM held its White Coat Ceremony for the Class of 2018, and it was probably one of the biggest highlights of my life so far. I was lucky to have my parents and my little sister come to town to share in the special occasion (and watch my daughter, lol), and although it was a short ceremony, it was pretty awesome. Our Class Chair gave a speech that pretty much brought everyone to tears, and we even had one of the past students (who is now a 4th year General Surgery Resident) speak about her battle with breast cancer while she attended GA-PCOM and what the white coat means to her. Sitting through the ceremony really made me reflect on everything it took to get to this point, and words really can’t describe how blessed I really am. 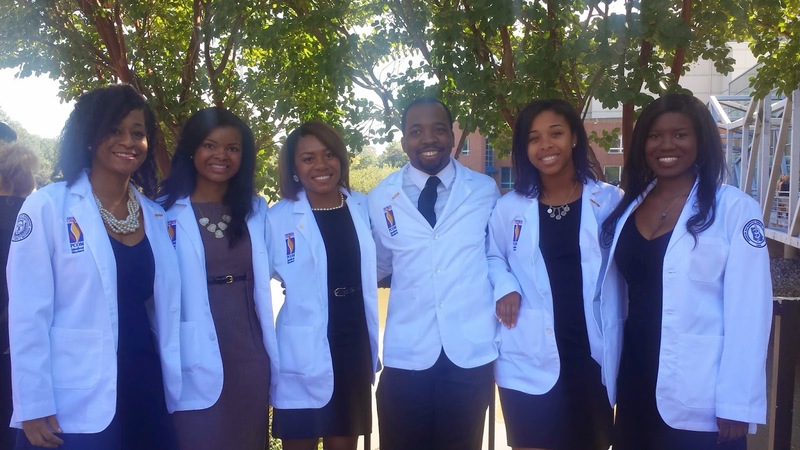 It’s amazing that something as simple as a white coat can add so much confirmation to my purpose in life. I get really emotional just thinking about it, and I’m nowhere close to even graduating yet, LOL! But anyway, the majority of this post will be pictures because I need to get back to studying. I had both a written and practical exam today, and I have one more exam to take tomorrow before I can finally relax. While having family in town was nice, it definitely took away from my studying and my written exam score definitely reflected that today, so back to the books! Can't look at this picture without smiling! 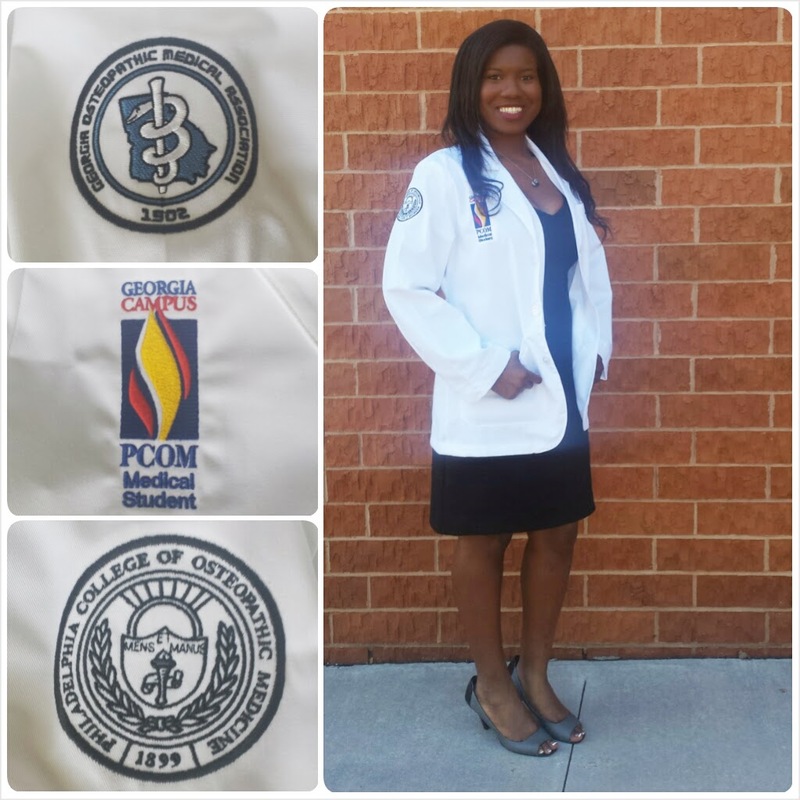 So happy to be a GA-PCOM student doctor! The moment I was "coated"
So blessed to know this awesome group of people! Last week was definitely a good one! I received the grades back for both my OMM and SPOM practical exams, and I am happy to say that I did well on both of them. I received mostly 100’s on all my stations for OMM, with the exception of cervical muscle energy. I was so nervous that I had my patient look the wrong way for the oculocephalogyric reflex, and it brought my score down 20 points for that one station. Overall I came out with an A for the entire practical, and I do not have to remediate any parts of the exam! Remediation is required if a student makes less than an eighty percent on any station on the exam, so I am pretty happy I managed to do well. As for SPOM, we received our practical grades back early Thursday morning, and I was just so happy that I did well enough to pass the entire exam altogether with my written score included. Later that afternoon we received an e-mail saying that the breakdown of our written scores was available, and when I went to check, I was shocked to find that my score jumped up 11 points! It turns out that a few questions had more than one correct answer or they were simply thrown out, and I was lucky enough to be on the receiving end of it. I finally feel like I am getting the hang of medical school, and even though the work never stops, I can finally stop stressing at least a little bit. Class, anatomy lab, and both lunch and dinner with the 18th Surgeon General of the United States. Friday was a very busy, but definitely good day! Aside from grades, Friday was definitely the highlight of not only my week, but medical school so far. 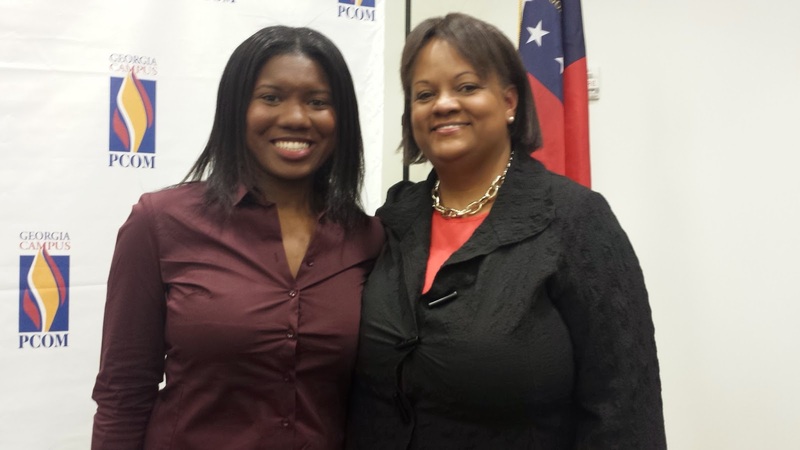 Dr. Regina Benjamin, the 18th Surgeon General of the United States, came to GA-PCOM to speak to us and hold a Q&A session during lunch, and it was a wonderful experience. The GA-PCOM SNMA chapter (which I am a member of) presented her with a quilt at the end, and she even let me take a picture with her. Not only is Dr. Benjamin extremely intelligent and down-to-earth, but she also holds 23 honorary degrees, and does a lot of work to help rural and underserved communities. It was definitely an honor to be in the same room with her. Later that evening, GA-PCOM held an inaugural Champions of Healthcare dinner that featured Dr. Benjamin as the keynote speaker. This was an amazing event that honored some of the outstanding staff, faculty, and students of GA-PCOM, and it was great to have one night of fun without studying. I also loved the fact that I got to have a chance to socialize and have drinks with both my professors and classmates alike. I thought I wouldn’t know too many people at the event since I am a first year student, but I probably knew half the people in the room! One thing that Dr. Benjamin said during her speech that evening was that the Lord takes you where you need to be, and as I looked around I couldn’t help but appreciate the fact that I really am where I need and want to be. I’m sure every medical student thinks their school is the best, but I truly believe mine wins hands down. 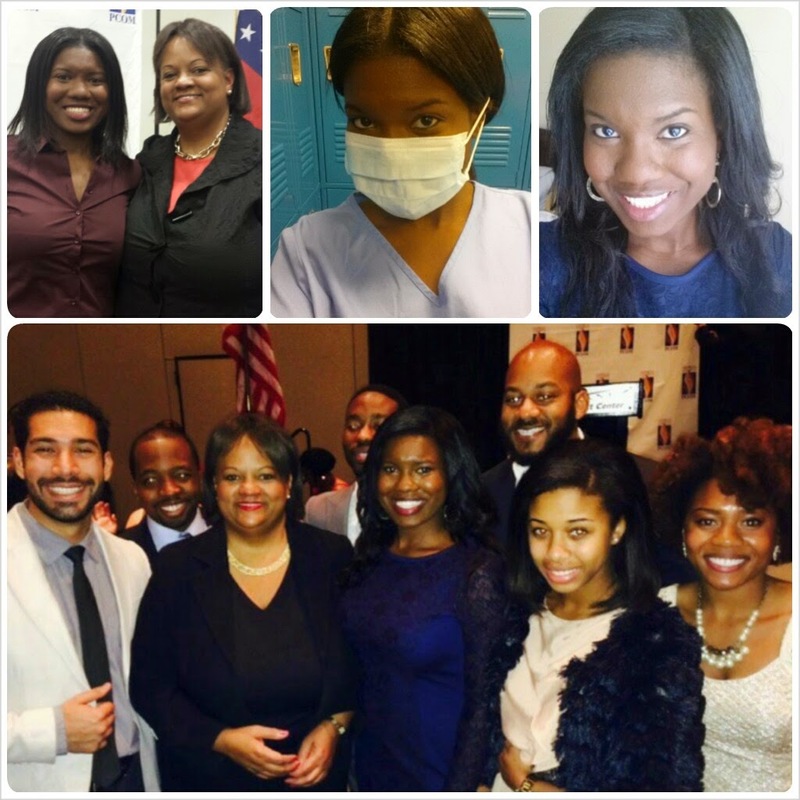 GA-PCOM has everything I could ever want in a medical school, including diversity, a sense of community, and amazing students, faculty, and staff alike. I just feel so blessed to have been accepted into the school, and I hope that I can continue to work hard enough, so that I too can one day become a champion of healthcare. A large part of medical school so far has been finding the most effective ways to study and retain the huge amount of information that is constantly being thrown at me. I’m still working on tweaking my study habits, but since I was asked, I figured I would make a post about what is currently working for me. Hopefully by the end of the term, I will have a more solid breakdown of the things that really help, but this post should serve as a good general breakdown. 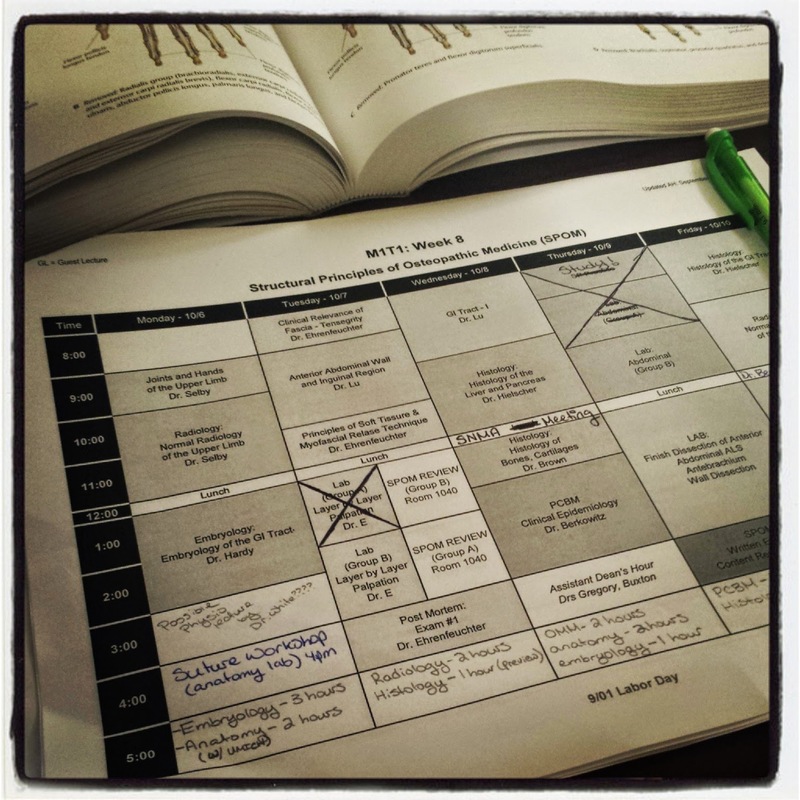 I’ve mentioned it before, but time management is a huge part of succeeding in medical school. People constantly tell me that they don’t know how I do everything while raising a child, but I think it’s actually a really big advantage for me. While most students have the option of going home and probably taking a nap or doing other things that distract them from studying, I don’t have that luxury. Because I have a child, virtually every minute has to be accounted for. I don’t have the same amount of study hours as my peers, so I have to make every second count. It’s easy to put off studying when you have the option of waking up early to do it, but it’s a different story when you have to wake up at 6am and get your child ready for school. What works for me is breaking down the schedule and giving each lecture a set amount of time spent studying for it. We are expected to study 5-7 hours outside of lecture, but right now I am currently averaging around five hours a day of studying. Normally one class will have had more hours than the others, so I try to devote three hours a day towards studying for that, and I give the other classes about an hour of study time. If I get out of class at 5, then that gives me one hour of study time before I have to pick up my daughter, and then my mommy/free time is typically from 6-8pm. I study another four hours from 8-12, and then I am done for the night. So far I have been good about hitting my goal, but there’s always a little extra time when anatomy lab gets out early or when my group is not going for OMM lab where I can get in some extra study time. This is definitely something I can improve on. The only way you can truly gauge how you’re doing on a subject is by quizzing yourself and doing practice tests. There are a ton of websites that have quizzes to help you, and so far I have found the Board Review Series (BRS) books pretty amazing. Also, make sure to go over your answers and figure out where you went wrong. I did not do this with the exam I just took, and I am convinced that at least one of the questions was very similar to one I did in the BRS book, but did not go over. For anatomy, the University of Michigan has excellent practical and written exams, and I also really like the SUNY Downstate material. I used Firecracker for about a month until my free trial ran out, and I think it’s a pretty good resource as well, although a bit pricey. I recently got great advice from one of the second year medical students on studying, and the key point was to make sure to review the material at least five times outside of lecture. That means attend or listen to the lecture at least once, review the material three times over a semi-spread out timeframe, use the fourth time to take quizzes, and devote the fifth and final time to group studying. Even if you’re not a fan of group studying, it can reveal things to you that you might not have learned, so it’s a good thing to do if only for an hour or two. I haven’t actually done this yet, but we just started a new block and I plan on implementing it, so I will let everyone know how it works out for me after the next exam. Outside of repetition, YouTube and mnemonics have been lifesavers when it comes to retaining information. Mnemonics make it easier to remember long lists of things (ie the branches of the external carotid artery), and I find that the more dirty they are, the better they work. I have also found some amazing videos on YouTube that have explained things to me in five minutes or less despite having spent hours on my own trying to figure it out. YouTube pretty much has videos on anything you can think of, so if you get stuck on something, use that search function! I remember things that are really off-the-wall and eccentric, and some of the videos posted have all the elements needed to make the information stick in my mind. It’s important to remember that everyone has different ways of studying, so what works for me might not necessarily work for you. During orientation, I took a LASSI exam and found out that I am a strong read/write learner. I already knew this, but I learn best from reading the textbook and taking my own notes. This doesn’t work for everybody, and it is a really big waste of time to not study in a way that feels comfortable to you. Furthermore, what worked for you during your undergraduate years will probably not work in medical school just because of the sheer volume of material. Don’t be afraid to spend a month or two tweaking your study techniques until you find something that works. Also, I’m pretty sure that all schools have learning centers with people there to help you find effective study skills, so use them! This pretty much sums up everything for now, but I’m sure I will have more posts on the subject in the future. The current term ends for us in November, and then we will start a completely different block that will consist of full days of lectures without labs. This is probably when I will have to really get a handle on things, but for now I am sticking with what I have written above. 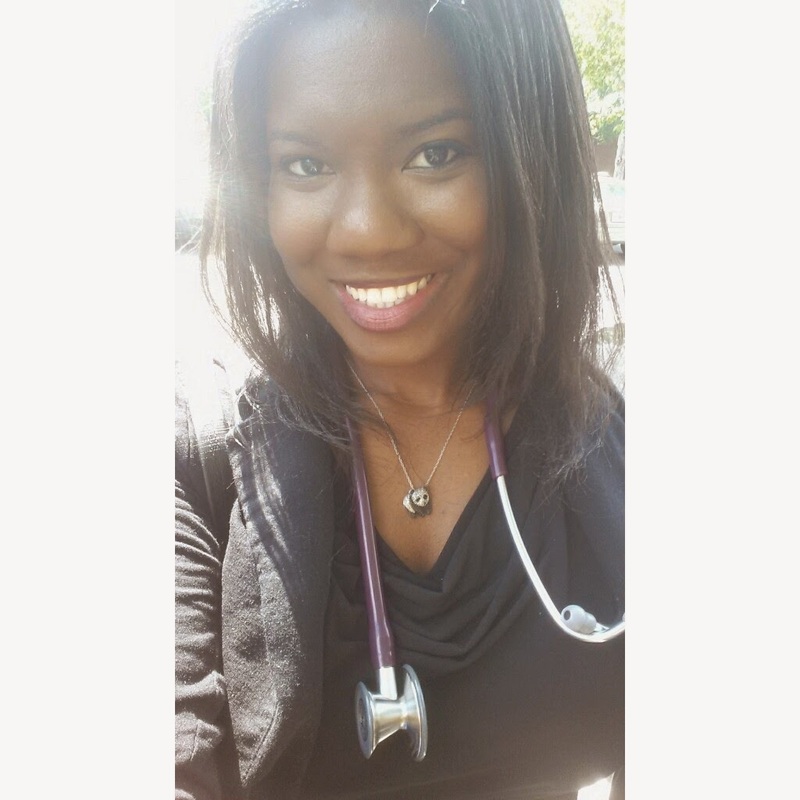 I wrote this post in terms of medical school, but I think the tips can be used by anyone whether you're in medical school, graduate school, or undergraduate school. It's important to build a good foundation early on so that you don't struggle later, so I hope this post helps! Exam 1: PCBM (Preventative and Community Based Medicine) – This exam covered epidemiology and statistics and was only an hour long. If you know anything about me, then you know I absolutely hate math which is a pretty large portion of this class. Basically I had to know t-tests, Chi squares, Type I and II errors, and a whole bunch of other statistical stuff for this exam. It wasn’t fun, but I managed to do really well (which was an absolute necessity because I bombed the first exam). 9/26 Exams 2 and 3: SPOM and PCS – Yes, I had two exams back-to-back on this day :-( SPOM (Structural Principles of Osteopathic Medicine) is something you’ll probably see me write a lot about between now and November, and it covers five subjects. These subjects are anatomy, embryology, histology, physiology, and radiology. We do not get separate exams for each of these subjects, but instead we get one three-hour written exam that covers everything learned since the previous exam. To give you a better understanding of how extreme it is, think of finals week where you take multiple 1-2 hour exams for each subject, and just combine all that information into one exam. It’s intense, but the good news is that once we finish an exam, we no longer need to worry about the information (well, until we take the boards in 2 years). As for PCS (Primary Care Skills), this exam was only an hour long and I was so busy studying for SPOM, that I completely forgot about it. I basically had 20 minutes to study for it in between tests, and I was so happy to have made a B on it! The patient stuff comes pretty easy to me, and a lot of it is common sense, but there were definitely a few questions that I just outright guessed on. 9/29 Exam 4: SPOM Lab Practical – This exam coincides with the SPOM written exam and is worth 40% of the overall grade for SPOM. For this exam, we have 40 seconds to answer an identification and secondary question on each cadaver, so it’s only about an hour long, but you really have to know your stuff. It’s especially hard if the body that you’re looking at isn’t properly dissected. Textbooks have pretty pictures of body parts, but it definitely isn’t like that in real life. The good news is that if a student has failed the written portion of the exam, they can redeem themselves by doing really well on the practical portion. I find I’m pretty good at the practical, but horrible on the written exam, so the SPOM practicals really save me. I have no idea how I did on this though since it is hand-graded, but hopefully I’ll find out by next week. For the practical, we were given time slots for when we had to act as patients as well as times for our actual exam. I was lucky that I got to be a patient first, because it kind of helped ease my nerves a bit having already been in the exam room. There were five stations: palpation, range of motion, cervical muscle energy, thoracic muscle energy, and lumbar muscle energy. The professors would tell us a technique and we had to perform it properly. I’m not sure how I performed on this because there were definitely a couple of things that I forgot to do, but hopefully I will not have to remediate. This would mean that they would give me a failing grade of 69, and even if I properly performed the technique in remediation, the failing grade would still stand. So there you have it. A few of you were wondering what I was up to, so I had to come back and let everyone know that I am okay. It has definitely been a stressful week, but with determination and a whole lot of prayer, I made it through! We also started another block on Tuesday, but with all these exams in the way, studying for current classes kind of fell through. I will definitely catch up tomorrow and this weekend, but tonight I’m relaxing! I also haven’t responded to any e-mails or messages, but just know that I am not ignoring you. I’ll try to respond to a few tonight, but you should plan on hearing from me by Sunday at the latest.